Yes it has arrived and it is more than I expected it to be. The 27 inch monitor is so much bigger than 5 inches extra from the 22 inch. 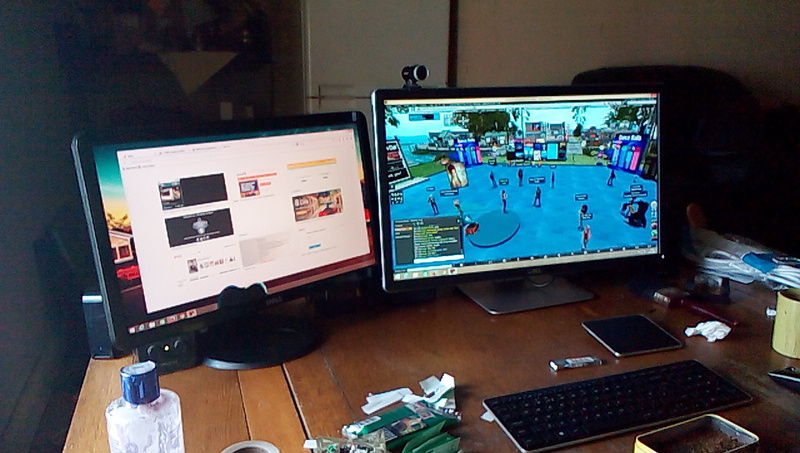 However I can seamlessly join the two monitors together. creating a space of 3890 x 1080. Because they both run at 1080p each window can be dragged to either monitor or stretched to cover both without loss of resolution nor having to be resized. Click on the picture to view better. As you can see without zooming the whole of the dance floor can be viewed. Awesome. The speed of the new system is super and I am really pleased how second life performs. Running at 18 fps in high to ultra. But I will play with the settings and see. I made a video using two monitors but the processing size is only 2048 x 500. This needs work. Here is my second attempt. Watch full screen. hehehe I will play. should be able to get it bigger I think.